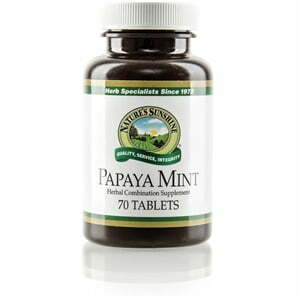 Nature’s Sunshine Papaya Mint Chewable Tablets have a dual purpose. First, they provide nourishment to the digestive system, and, second, they function as a breath mint. An enzyme in papaya called papain breaks down protein for better digestion while the peppermint in the formula helps produce digestive fluids. 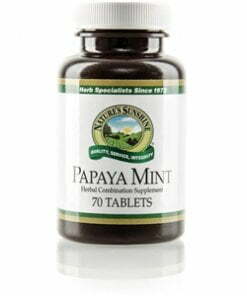 Papaya Mint Chewable Tablets contain papaya fruit, peppermint leaf, fructose, and sorbitol. Instructions: Chew two tablets with a meal three times daily. May also be used as a between-meal breath freshener. Sorbitol, fructose, stearic acid, and silica gel.